My pumpkin obsession is continuing today with some yummy pumpkin pancakes. I decided to switch things up a bit and got some inspiration from the cute Melissa from the blog Number 2 Pencil and created a pop version! After all, doesn’t everything look cuter on a stick? This recipe has it all… pumpkin, spices, buttermilk… it’s melt-in-your-mouth amazing. If you are a pumpkin fan, you will love this and hate thank me for introducing you to the recipe! This recipe makes a LOT of mini pancakes. We ended up running out of sticks and making just plain ol’ mini’s. Which worked out perfectly for our freezer food collection! 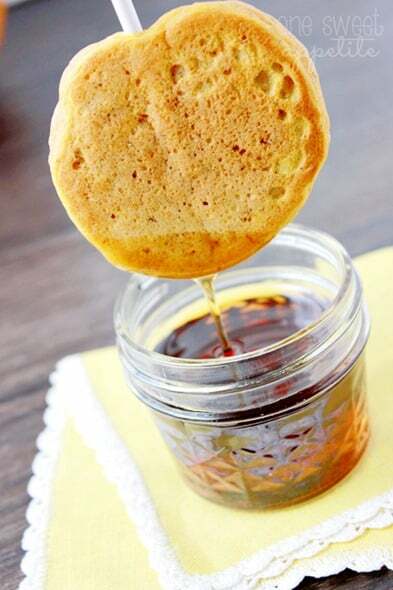 We love to keep pancakes in the freezer for early mornings, or after school snacks. Pop them into the microwave or toaster for a few seconds and you are good to go! I’ll be honest, dipping these cute little suckers in syrup made me feel a little like a kid again! My little guy thought it was such a fun twist on the typical serving option! If you want the tutorial on how to make these in a pop version, check out the tutorial over at Number 2 Pencil. What are your favorite pancake flavors? 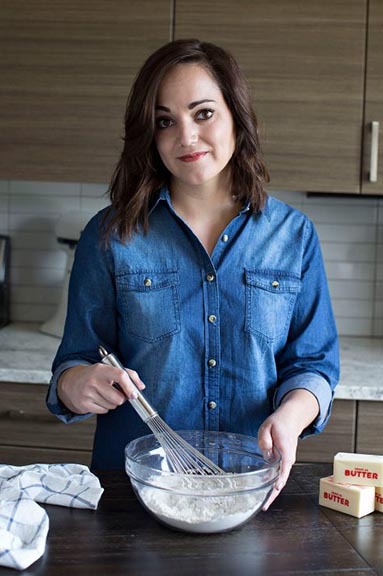 In a large measuring cup, whisk together the buttermilk, pumpkin, egg, and butter. Set aside. Whisk the flour, brown sugar, powder, soda, cinnamon, nutmeg, ginger, and salt in a large bowl. Fold in the wet ingredients until just combined. Be careful not to over mix. Preheat a skillet to medium heat. Spoon small amounts of batter (I used a cookie scoop) onto your pan. Cook 1-2 minutes, or until lightly browned on the one side, flip and cook until the other side is golden. Serve with syrup or eat alone. These definitely look like a way I can get my 2 year old to eat! Thanks for sharing! Oh these look fun and yummy! My kids would have such fun with this. – Pinned. These look completely amazing! I need them! Pinned! 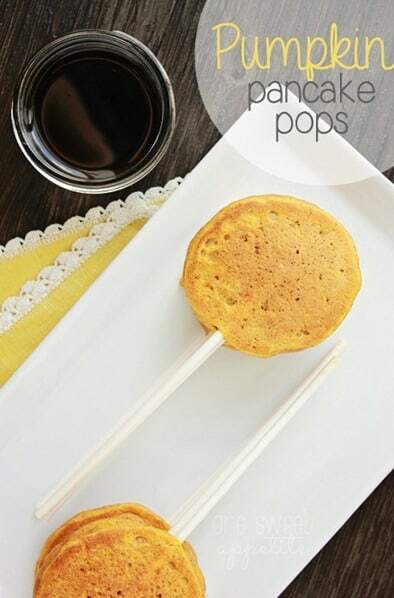 These look delicious and what an adorable idea! I’m definitely obsessed with pumpkin right now too. It’s perfect for fall. I think anything on a stick is just so adorable! Now I want breakfast! Oh, I think my grandkids will love this. I think I will make them the next time they spend the night! What a great way to entice kids to eat their breakfast! 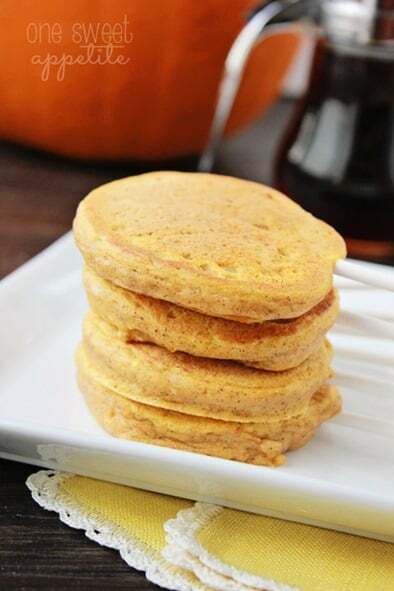 Pumpkin pancakes are perfect for this time of year.